This 18.5" monitor features a 1366 x 768 panel with overscan/underscan functionality, front panel buttons along the right side of the screen and two assignable function buttons so you can skip the menu and go directly to often used functions. The monitor supports up to 2K 30p via SDI and 1920 x 1080 30p via HDMI. A built-in headphone jack allows you to monitor your audio, while you can visually monitor the audio level meters overlaid on your image. Focus Assist and False Colour provide critical information on a large screen, so your operator can concentrate on framing without distractions. 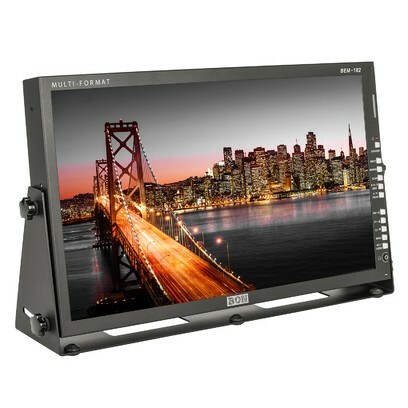 The frame guides and The loop through SDI functionality allows this monitor to be close to the camera for exposure and focus checks while inputting the SDI signal and sending it downstream instead of being at the end of the video chain. The Bon BEM-182 supports input signals up to 2048 x 1080, automatically sensing and adjusting to properly display the image. The monitor supports and displays 60Hz and 50Hz compatible frame rates in progressive, interlaced and Psf. Up to 24p in 2K, 59.94p/60i in Full HD, 23.98/24p, as well as NTSC/PAL. A variety of signal display tools can be overlaid on your image, this includes Waveform, Vectorscope, V-Chip information (SDI only), Closed Captions, Center Marker, Safe Area markers, and Marker Mat - which allows you to choose how to display area outside the marker. Choose between normal, grayed out, or black. The focus assist feature allows you to quickly toggle through the color of the peaking from blue, green, and red. You can adjust the sensitivity of the peaking from 0 to 48. You can set the aspect ratio to display the input signal in, from native, to 4:3, and 16:9. You can also activate the anamorphic adjustment, which allows you to display 1.37:1, 1.66:1, 1.75:1, 1.85:1, 2.35:1, 2.39:1, 2.40:1, 2.55:1, 2.59:1, 2.74:1, and 3.56:1. You can display images from more than one input using the picture in picture selection, which allows you to place images from two different inputs next to each other. Whichever input is selected as the main input, then the other input is automatically selected as the sub image input. Supporting 3G/HD-SDI, and HDMI inputs. The SDI input features a loop through input/output connectors.